To market to market to buy a fine pig, home again home again jiggety jigg. Yesterday I was to be found flogging my wares at Hitchin craft and farmers market. There was not a pig in sight. Even so, the market was buzzing and the weather was beautiful and I had South African bunny chow for lunch, which was also beautiful. I met some lovely people and my jewellery sold pretty well! Prior to the market I'd been working on things to decorate the stall and hopefully attract interest. 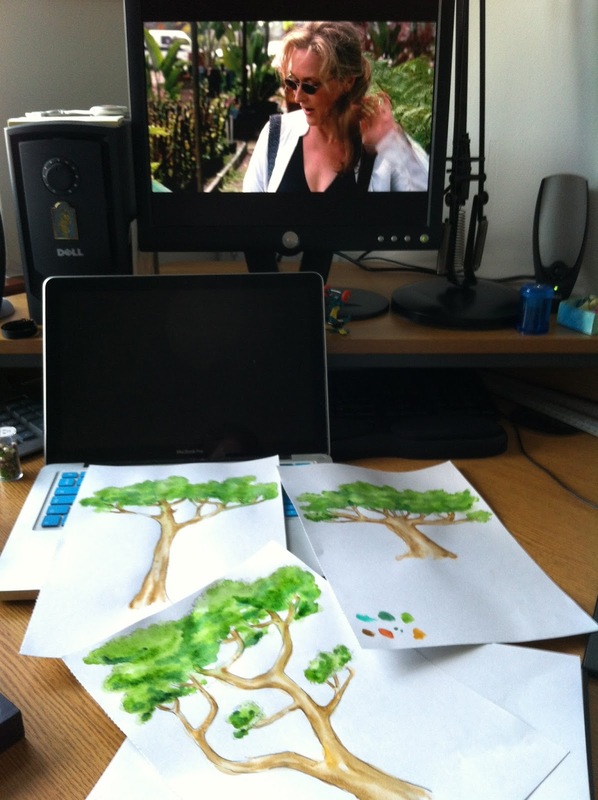 I've spent hours painting, printing, backing on card and cutting out trees. I was watching Adaptation. Hey Meryl! To see how it all came together I set it all up and played market in the kitchen, and now that I'm all grown up I'm allowed to play with real money. I put boxes under the cloth at the back to give it a bit of depth, but forgot to bring these to the actual market itself, despite walking round the house in the morning repeating "boxesboxesboxesboxes"to myself. My glamourous assistant and business card ninja. I learned a lot of things, it was really interesting to see which items were most popular and to hear peoples feedback about it all. I'll definitely be back again and next time I'll be armed with even more trees, perhaps another garland or two, a flask of tea and chairs....definitely chairs next time. And next time I aim to have the table look more like a safari landscape, as well as more trees I might also make some wild grass and perhaps even a jeep! So where is Hitchin craft market? Is that Hitchin in Hertfordshire? It would be good to see photos of some of the jewellery that sold well. ahh, well thank you, I hadn't though about doing that, but I think you're right! Thanks for the comment! Hello, I'm Kat. I'm always making something or other. I've got a huge soft spot for miniature things and am partial to a bit stop-motion animation. © Kat Simpson. Picture Window theme. Powered by Blogger.